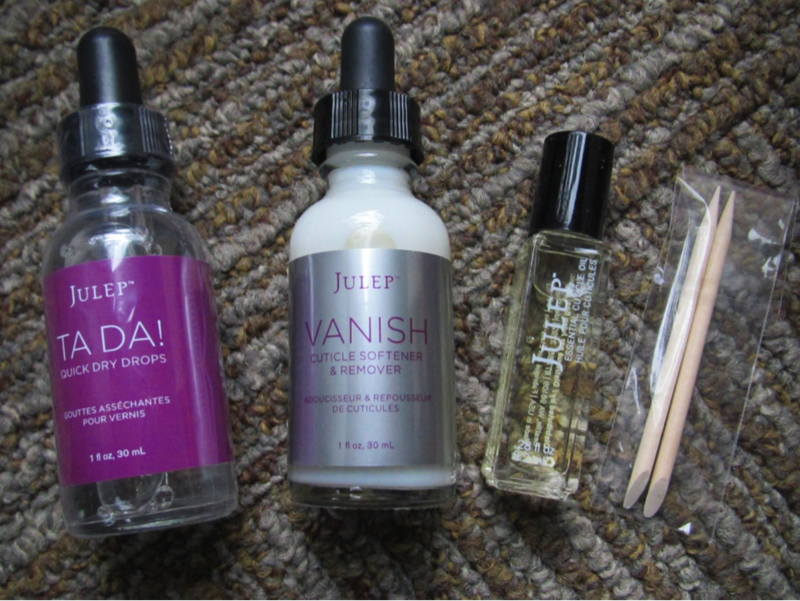 Julep also threw in a couple of wooden cuticle pushers and a coupon code for 10% off their new cuticle pusher tool or the Vanish Cuticle Softener & Remover! The code is CUTICLE10 and can be used through January 31. You can see that my cuticles desperately needed the cuticle oil! I love that it comes in a roller bottle, and it has a pleasant, light herbal smell. You can also choose three add-ons to your box every month. I was able to get one of the polishes for free using my Jules, rewards points that Julep gives Mavens every time they take a box! 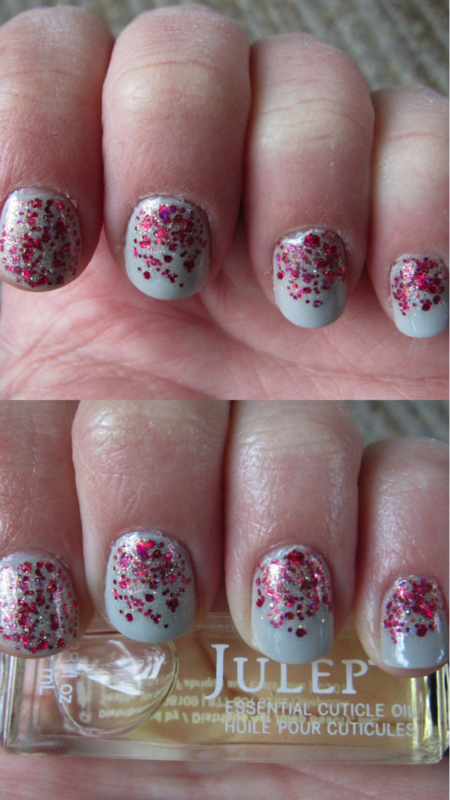 Shown are Mona (dark gray creme), Margot (old Hollywood gold shimmer), and Abigail (a soft pink in a silk finish). I had to try Margot right away, and it gave me an excuse to use the Vanish Cuticle Softener & Remover. It worked like a charm! I scraped away lots of visible cuticle from my nail, even on top of the nail itself. (Kind of yucky, but my nails looked really clean afterwards, and I hope it will make my manicures last longer.) But back to Margot – what a stunner! This is truly an eye-catching polish. The top picture is in indirect sunlight and the bottom is in direct sunlight. It looked nice with one coat, but I added a second coat for even more sheen. I also used the Ta Da! Quick Dry Drops on each coat, which are easy to apply (1-2 drops after the polish has been on for one minute) and smell of lavender. 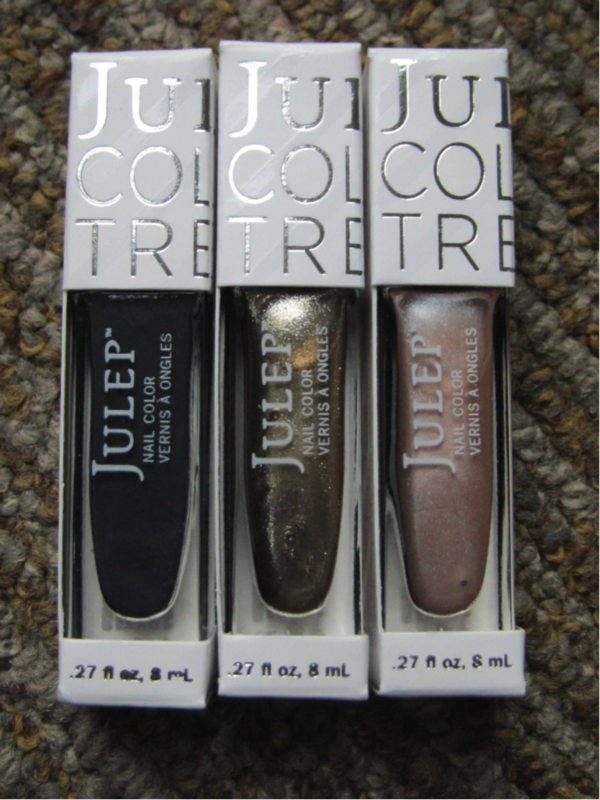 Julep does a fantastic job of drawing me in every month with their range of colors and box options to choose from! Your first box of the subscription is free with code FREEBOX, and you only have to pay $3.95 shipping. (Once you become a Julep Maven, shipping is always free though.) Click here to take the style quiz and choose your introductory box. There is also a section of Julep’s website, the Jule Box, that is exclusive to Mavens; you can buy past boxes there if you want to pick up the January Modern Beauty box or any of the others! This review was brought to you by one of our great MamaBreak fans, and may contain referral links.